This is an original mixed media drawing of a black rhinoceros. The piece was created with pen and ink, graphite, and colored pencil on a blue gray paper. The drawing measures 8" x 11" and has a custom double mat. The finished piece is 11" x 14" and will fit into any standard sized 11" x 14" frame. All of my art and mats are made with the highest quality materials available. The artwork was created with professional-grade art materials on acid-free paper, and the double matting and backing board are all acid-free. 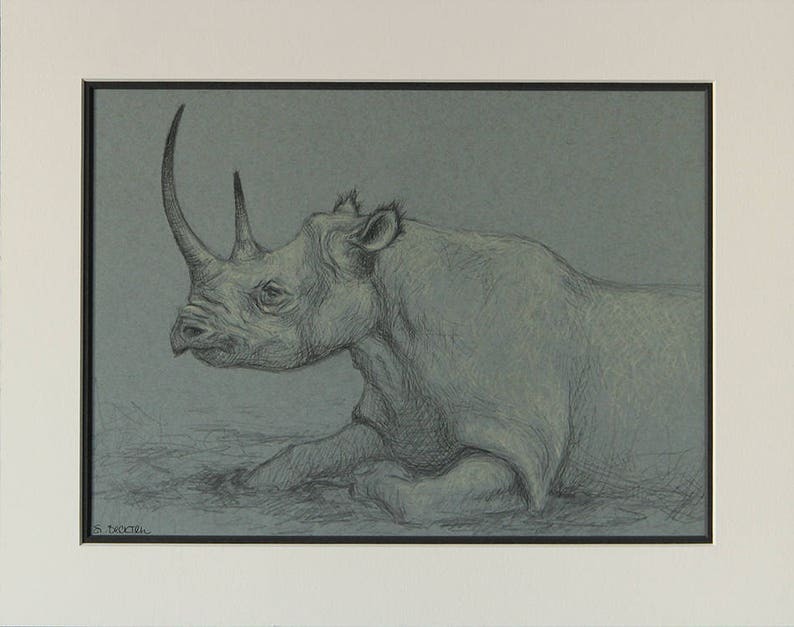 If you would like to receive your drawing professionally framed and ready to hang, you can select the optional framing package! This package includes the 1" beveled black frame (shown in photo 2) and UV-resistant acrylic glazing. * The framed piece will be backed with black paper, wired, and ready to hang (with a hanging hook included.) The framing package is just $75, which is a fantastic deal for beautiful custom framing! This painting is such a joy! I smile every time I look at it. Thank you Sarah. I've been following this artist for years at local exhibitions and was so excited when she finally opened an Etsy shop! I purchased three paintings from Sarah; two as Christmas gifts and one for myself. 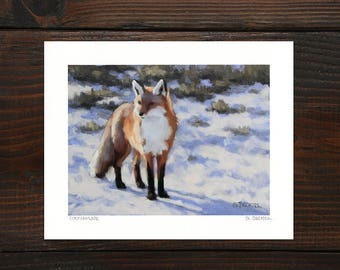 Her paintings are stunning and truly capture the textures of her animal subjects beautifully. Sarah shipped the pieces promptly and included all the hardware for hanging, making it incredibly easy to display. My husband and I couldn't be happier with our skull with mums painting and look forward to seeing Sarah's next inspiration. This s my second purchase from this shop. As for the piece: I'ld give it ten stars if I could. It's technically beautiful and artfully conveys a moving sentiment. As for the details of the purchase: The mechanics of the purchase went smoothly and as expected. Overall: Don't hesitate to purchase from Sarah. You will be glad you did. Beautiful painting! A privilege to own. I can almost "feel" the softness of the fur. The piece I chose is close to as shown online as in person but better... Sarah's portraits are perfect for either the art OR animal lover. Both are well represented. It arrived well protected as wrapped and came two days after the shipped date with tracking. Currently, orders are accepted and shipped within the United States only. Accepted forms of payment are Paypal, credit card, debit card, and Etsy gift card. Items are packaged with the utmost care. However, if your item is damaged during shipment, please notify the shop within 3 days of delivery and I will issue a replacement or a refund of your payment. Replacements and refunds for transit-related damage will not be issued later than 3 days after delivery. I want you to love your purchase! If you are unhappy with your item for any reason, please notify the shop within 7 days of delivery and I will issue a replacement or a refund of your payment. Refunds will be issued after the item has been returned in original condition. All items are shipped via USPS priority mail. Items are shipped 1-5 days after purchase, or as specified in each individual listing. You will receive a tracking number after the item has shipped, and delivery should occur 1-4 days after the shipment date. Occasionally, items can be temporarily or permanently lost in the mail. How inconvenient for us all! If you believe your package has been lost in transit, please contact the shop immediately so we can work to resolve the issue. If an item is permanently lost, it will be replaced or refunded.